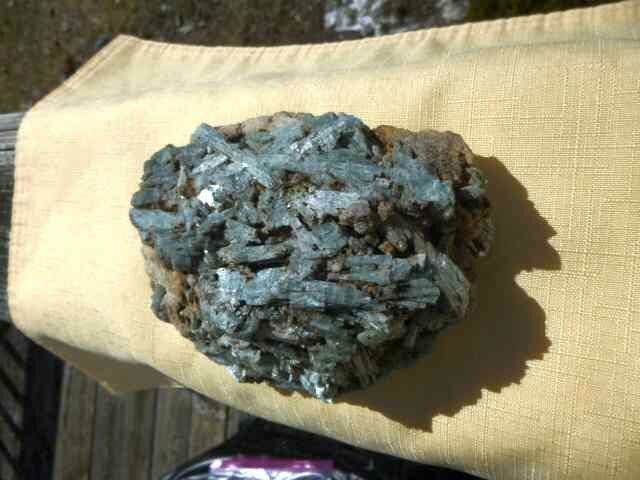 Cr-rich green Tremolite with lot's of stuff holding it all together. I realize this is not a lapidary forum, is it feasible to grind or ultra sonic away a lot of the matrix to improve the looks, wouldn't mind a few smaller pieces for display. Hall Farm. 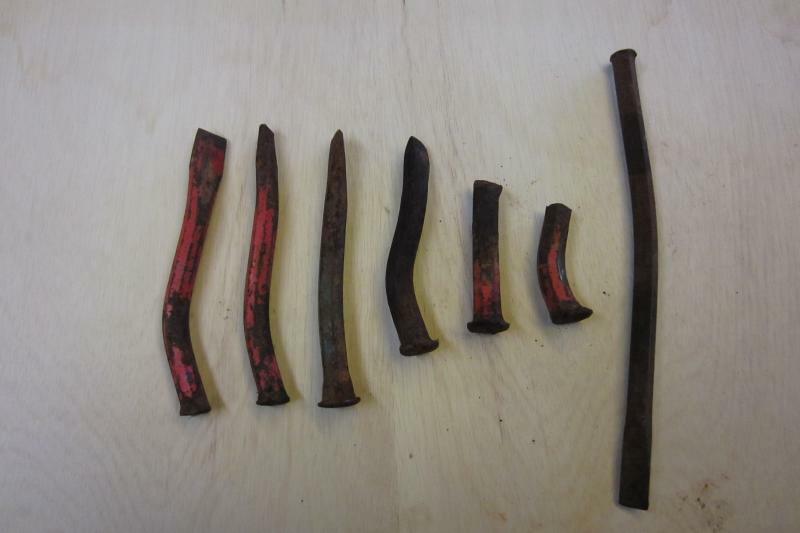 Iron Out will remove a lot of the iron oxide stains, or you could use muriatic acid. If part of the matrix is marble/calcite, then the acid will attack it, resulting (maybe) in several smaller specimens, if they are unattached to the entire mass. The amphibole crystals under the calcite should be sharper and less-weathered, since the calcite protected them. What is the locality? Looks similar to specimens I collected in Ontario. As Susan said Rust Out or Iron Out are two products on the market sold in plumbing supplies and both will soften and remove the iron containing soil and oxidized coatings, After that I used soda blasting for a final good shiny look. I do not like the hydrochloric acid, since the amphibole is hard you can remove some calcite manually so the natural look will be preserved. The specimen of tremolite crystals does not look as though it had chromium in it, since the green is not the right color. 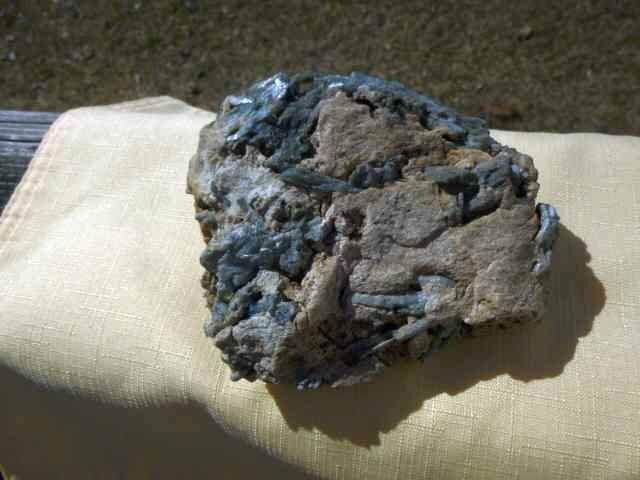 The only places that have produced Cr-tremolite in St. Lawrence Co. are the Balmat District and a locality in the township of Macomb. The marble quarries in the Gouverneur area did not have tremolite crystals like this in them, but your specimen may have occurred in the calc-silicate rock which is in association with the Gouverneur marble at the Hall farm locality. I only used the Cr-rich seeing it applied in a different post. I will correct my records thanks. I bought it at my club shop silent auction. It was collected by a member and the slip only say's Hall Farm, North Gouverneur, NY Thanks for the location, I will enter it and make card for it. I do have Iron Out powder from the hardware. Also how do you tell Chromium rich? Cr-rich tremolite has a much brighter green color, almost like someone soaked the crystals in creme de menthe liqueur. Look up "Cr-tremolite, Washburn farm, Macomb, NY" on Mindat or even "Cr-tremolite, Balmat, NY". You'll see the difference in the green color. The famous locality at Outokumpu, Finland, produced Cr-rich diopside crystals, too.